← When Should You Buy a New Toothbrush? Do you grind your teeth? Some of us are aware of the issue, but others aren’t. If you aren’t, then it is most likely happening during your sleep at night. And if you are, it’s because you may be doing it as a nervous habit, or it could be a disorder that should be looked at. Please keep in mind that these symptoms may also resemble other issues or ailments that you could be experiencing. To help put this into perspective, think of teeth grinding as a way of applying sandpaper to your teeth. After awhile, you begin to wear the teeth down – all the way to stumps in severe cases. But most people are able to detect problems before that could occur. However, this wearing down of the teeth could result in weakened enamel structure leading to fractures, loosened teeth, or even loss of teeth. On top of this, teeth grinding also affects your jaw, causing TMJ (or worsening existing TMJ), and could even change the entire appearance of your face. Why People Grind Their Teeth? Stress – stress is almost always a cause for many different ailments, issues, and diseases we face. Most often people that experience grinding and clenching of their teeth as they sleep are because they are experiencing a high amount of stress. Jaw disorders – disorders such as TMJ may cause clenching and grinding. Alignment issues/malocclusion – if our teeth are not aligned properly, then our jaw muscles attempt to solve the issue through sliding teeth and clenching of the teeth. What the Best Way to Correct this Issue? 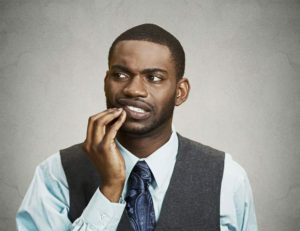 First off, it’s important to see a professional to see whether or not it’s teeth grinding that you are suffering from. If this is the case, then they can discuss various non-invasive treatment options such as custom-fitted mouth guards and lifestyle changes. This entry was posted in Doctor2th and tagged grinding teeth causes, grinding teeth symptoms, grinding teeth while sleeping. Bookmark the permalink.